How much do we need to drink? Whether spring-sourced, sparkling, flavored, or simply out of the tap, water seems to have become the beverage de rigueur these days. And for good reason----water constitutes about 60% of our body weight and is essential for most bodily functions. Taking in enough fluids each day is highly important since inadequate intake, leading to dehydration, can have serious medical consequences. How much water do we need? 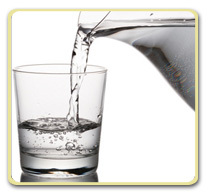 Many people have heard of the recommendation that we should consume "8 ounces of water, 8 times a day". However, in a report published in 2002, noted physiologist Heniz Valtin researched this question and found no scientific evidence to support this "8 x 8" recommendation. His evidence showed that healthy bodies do a remarkable job at self-regulating their fluid balance and that the "8 x 8" recommendation may in some cases be excessive. This position was echoed by a 2004 report from the Institute of Medicine (IOM) who stated that "the vast majority of healthy people adequately meet their daily hydration needs by letting thirst be their guide." The IOM did set general recommendations of total water intake at 2.7 liters (91 ounces) for women and 3.7 liters (125 ounces daily) for men. comes from food, those with high water content such as watermelon, broccoli, lettuce and yogurt also contribute to our daily requirements. Are there situations where more than the "8 x 8" recommendation applies? It should be noted that the recommendation to let "thirst be your guide" applies primarily to healthy, sedentary adults living in a temperate environment. There are a number of circumstances in which our fluid requirements increase significantly. Examples of this are working in a hot/humid environment, exercising for a prolonged period of time, or in association with certain illnesses. For short bouts of exercise, this may just be an extra 1-2 cups of water, but for more intense exercise lasting an hour or more, regular intake may be required to avoid dehydration. Depending on the ambient temperature, this usually means taking in 2 to 3 cups an hour. With strenuous athletic activity lasting several hours, or if working in the heat, a sports drink (e.g. Gatorade, Powerade, others) may provide the additional benefit of replacing electrolytes lost in sweat. Illnesses, such as fever, vomiting and diarrhea, cause your body to lose additional fluids. In these cases you should drink more water and may even need an oral rehydration solution, such as Pedialyte. The average urine output for adults is 1.5 liters a day and people lose almost a liter of water a day through breathing, sweating and bowel movements. Since approximately 20% of our daily fluid requirement is met through the foods we eat, this leaves about 2 liters (or about 8 cups) to get through drinking water and other fluids. This could well be the origin of the "8 x 8" recommendation. In any case, it appears that if you drink enough fluid so that you rarely feel thirsty, intake is probably adequate without having to count your cups. If you have any questions about how much water we need, please log into your account and send us your question. We are here to help. 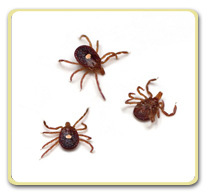 People who live in the southern and central United States, areas of the country where bites from the lone-star tick (Amblyomma americanum) are common, are reported to be at risk of developing an allergy to red meat. The allergy is thought to develop as a result of exposure to a carbohydrate called alpha-gal (galactose-α-1,3-galactose) that is transferred from the tick to humans via their bite. Alpha-gal is present in several mammals (e.g., cows, pigs, deer, sheep, etc.) but is not naturally present in apes and humans. Ordinarily, when meat from one of these sources is consumed by humans, the alpha-gal remains in the digestive tract without causing problems. If alpha-gal is transferred to the blood stream of a human during a tick bite, however, the body recognizes the carbohydrate as a foreign substance and initiates an immune response. During this immune response, antibodies (IgE) to alpha-gal are produced to protect the body from this carbohydrate which it perceives to be a threat. IgE antibodies are one of 5 classes of antibodies produced in the body and the one most commonly involved in allergies and allergic reactions. With subsequent consumption of food containing alpha-gal, IgE antibodies are released which bind to the foreign carbohydrate and trigger the release of histamine and other chemicals causing an allergic reaction. Alpha-gal-related allergy symptoms characteristically occur 3 to 6 hours after eating red meat, rather than the more typical hour or less common to most other food allergies. A blood test to measure for the presence of alpha-gal IgE antibodies is available, however, this test has not been approved yet by the U.S. Food and Drug Administration and may not be covered by certain health insurance carriers. At present, treatment of alpha-gal meat allergy involves avoidance of eating meat from mammals. Should mild symptoms occur despite avoidance efforts, treatment with antihistamines or corticosteroids should help. Anaphylaxis, also known as "anaphylactic shock", is a true medical emergency and requires immediate treatment. Symptoms of anaphylaxis include swelling of the tongue and throat, constriction of the airways, a weak and rapid pulse, and dizziness or fainting. Treatment typically involves administration of oxygen, anti-histamines and injectable epinephrine. People with meat allergy should consider carrying an epinephrine auto-injector (e.g. EpiPen) in case of a reaction. Non-mammalian meat (fish, chicken, turkey, etc.) does not contain alpha-gal, but milk and some milk products have been suspected of triggering the allergic reaction. Gelatin and protein powder with whey may also contain alpha-gal. Although most common in the southeastern U.S., alpha-gal meat allergy could occur in any area of the country where lone-star ticks are present. Other ticks, including the European Castor Bean Tick and the Paralysis Tick in Australia have also been implicated in the development of meat allergy. Reviewed and Approved by Charles W. Smith MD, Medical Director on 6-22-2016. What causes bursitis? Bursitis is usually the result of an overuse or a traumatic injury. Repetitive movements, such as throwing a ball, kneeling for prolonged periods, or running, are example of activities that can produce overuse injuries. Trauma, such as a blow to an area of the body overlying a bursa, can also lead to the development of inflammation within the bursa sac. Which bursae are most commonly affected? Fortunately, only a few of the bursae in the body are likely to become inflamed. These include the bursa at the side of the hip joint (trochanteric bursa), the one on top of the shoulder (subacromial bursa), a bursa on the front of the kneecap (pre-patellar bursa) and the bursa at the tip of the elbow (olecranon bursa). Trochanteric bursitis is a common problem that causes pain over the outside of the upper thigh. The trochanteric bursa rests between the bony prominence on the side of the upper hip (the greater trochanter) and a tendon that passes over this bone. Someone with trochanteric bursitis usually reports having hip pain at night, particularly when lying on the affected side. Pain may also be noticed at the outside of the upper hip when getting up from a chair or after prolonged walking, stair climbing, or squatting. Subacrominal bursitis affects the shoulder, causing pain with movement such as reaching overhead or behind the back. It is part of a broader condition known as "impingement syndrome", one of the most common causes for shoulder pain. With impingement, "pinching" of the rotator cuff tendons and bursa occurs between the humerus (upper arm bone) and the bony arch (acromion) that is situated above. While it is more likely to develop in individuals over the age of 40, it is far from a geriatric problem. Sports activities, including tennis, swimming, and baseball, can all cause subacrominal bursitis. Work-related activities, such as overhead assembly work, can also trigger this type of bursitis. 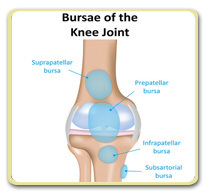 Pre-patellar bursitis affects the bursa on the front of the knee cap (patella). This bursitis is sometimes known as "housemaid's knee", since the repetitive pressure on the front of the knee from kneeling, as when scrubbing a floor, is a typical cause. Pre-patellar bursitis can also be caused by a direct blow or fall on the knee. In pre-patellar bursitis a fluid filled lump is often visible over the front of the kneecap. Olecranon bursitis is associated with marked swelling at the tip of the elbow. Prolonged pressure to the tip of the elbow, as could occur in someone who drives for long distances with their elbow on an arm rest, is an example of an activity that could produce this type of bursitis. A traumatic injury, such as striking the tip of the elbow in a fall, can also cause olecranon bursitis. What is the treatment for bursitis? While there are some differences in treatment among the various types of bursitis, a few treatment principles remain the same for all types. First a period of rest is necessary. This means avoiding activities that led to the development of the bursitis or those that aggravate the problem. Next, anti-inflammatory medications (e.g. ibuprofen, naproxen, etc.) are typically recommended to help control the inflammation. Intermittent application of ice to the skin overlying the inflamed bursa can also help to diminish inflammation as well as serving to reduce pain. Other measures that can be used in treating bursitis include physical therapy modalities, stretching exercises, cortisone injections, and rarely surgery. A special circumstance should be mentioned when treatment of bursitis becomes urgent. If the skin overlying the bursa becomes broken, such as with an insect bite or a scrape, bacteria may get inside the bursa and cause an infection. Infected bursae can become markedly swollen with redness and swelling of the overlying skin. Surgery, to incise the bursa and drain accumulated pus, along with antibiotic treatment, is usually necessary. So, if the doctor tells you that you have bursitis, don't feel like you are necessarily "over the hill". Bursitis is almost as common among younger, active individuals as it is in older folks. When experiencing joint or muscle aches and pains, many people seek relief from an oral pain medication, such as acetaminophen (e.g. Tylenol) or ibuprofen (e.g. Motrin). An alternative to this, particularly well suited in someone who cannot tolerate these medications, are topical pain medicines (analgesics). Topicals, which are applied directly to the skin, come in several preparations including gels, solutions, and sprays. Some of the most common applications for topical analgesics are joint pain associated with arthritis, nerve-related pain, and muscle soreness after physical exertion. What's in over-the-counter (OTC) topical analgesics? Several topical are available on an OTC basis. The active ingredients in these fall into a few general categories. Counterirritants (Icy Hot, Biofreeze, others) These topicals work primarily by creating a burning or cooling sensation that distracts the user from the painful stimulus. The active ingredients in these medications include methylsalicylate, menthol, and camphor. This class of analgesics has no effect on the underlying inflammation associated with arthritis and work primarily at the level of the superficial nerve fibers. Salicylates (Aspercreme, Bengay, others) The most well-known salicylate is aspirin. When absorbed through the skin, however, creams containing salicylates can provide some of the same pain-reducing effect as oral aspirin. 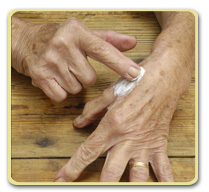 This class of topical analgesics may be particularly beneficial with arthritis pain in the fingers and knees. Capsaicin (Zostrix, Capsagel, others) Capsaicin is the chemical that makes chili peppers hot. When applied topically, it works by decreasing a chemical in the body (substance P) that is involved in sending pain signals to the brain. Capsaicin analgesics may be used to treat minor pain associated with arthritis or muscle strains. Topical analgesics of this class also work well for a type of persistent nerve pain following a bout of shingles (post-herpetic neuralgia). Are prescription topicals available? Oral medications in a class of drugs known as non-steroidal anti-inflammatory drugs (NSAIDs) are widely used to treat pain and inflammation. Ibuprofen (Advil, Motrin), naproxen (Aleve, Naprosyn), celecoxib (Celebrex) and indomethacin (Indocin) are examples of drugs in this class. Taken orally, however, these drugs can produce serious side effects including stomach ulcers, liver or kidney failure, and may increase one's risk of having a heart attack. In the U.S. a prescription topical that contains the NSAID, diclofenac (Voltaren Gel 1%) has been approved by the Food and Drug Administration for the treatment of osteoarthritis in joints close to the skin's surface, such as the hands and knees. A potential benefit of topical administration of this product is the avoidance of many of the side effects associated with oral NSAIDs. How well do they work? At the risk of sounding like a TV ad for a medication--- "your results may vary". Much of the evidence for the effectiveness of OTC topical analgesics is anecdotal, coming from users of the various products. Results of scientific studies evaluating the effectiveness of OTC topical analgesics have generally shown only modest improvements in symptoms. In regard to a topical containing the prescription medication diclofenac (e.g. Voltaren gel), however, there is stronger data supporting its effectiveness. In an analysis of multiple studies performed by an international body of health experts, topical diclofenac solution was found to be equally effective to that of oral NSAIDs in knee and hand osteoarthritis while producing a lower incidence of gastrointestinal problems. Are topical analgesics safe to use? Like any other medication, topical analgesics can have side effects or cause allergic reactions. The most common side effect, particularly with capsaicin-containing products, is a local skin reaction at the site of application. These medicines should not be applied to broken skin or to mucous membranes. It is important to let your doctor known if you are using any of the OTC products while taking other medications since it is possible for a drug-drug interaction to occur. Someone taking blood thinners needs to be particularly careful when using a salicylate-containing product since the combination can increase the risk of bleeding. If you have any questions about topical (rub on) pain medicines, please log into your account and send us your question. We are here to help. Whether called fibrocystic breast "changes" or fibrocystic breast "disease", it's a problem that affects up to half of all women at some point during their lives. Currently, most doctors just refer to women as having fibrocystic breasts, since it really isn't a disease at all. Fibrocystic breasts are lumpy, thick, and tender, especially right before menstruation. The condition primarily affects women between the ages of 30 and 50 and tends to become less of a problem after menopause. Why do breasts develop fibrocystic changes? Fibrocystic breast changes are linked to the hormone production that occurs during the menstrual cycle. There is no proof that drinking caffeine, eating chocolate, or eating a high fat diet is primarily responsible for this condition. What symptoms are associated with fibrocystic breasts? Specific symptoms include breast soreness, swelling, and heaviness. 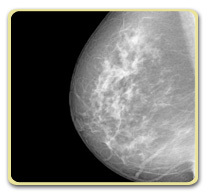 Generalized breast lumpiness occurs most commonly in the upper/outer aspect of the breast (the portion closest to the armpit). Symptoms are generally worse right before the menstrual period, and then improve after menstruation begins. Women who take hormone replacement therapy often have more symptoms, whereas, women who take birth controls pills have fewer symptoms. uation, since this is unlikely to represent a fibrocystic change. In some cases, it may be necessary to obtain a sample (biopsy) of breast tissue with a needle or by surgery in order to make an accurate diagnosis and differentiate between a fibrocystic breast condition and breast cancer. Is there a treatment for fibrocystic breasts? Treatment may not be necessary if symptoms are absent or tolerable. When painful, treatment is usually directed at the symptoms themselves, or at the hormonal changes that cause fibrocystic breasts. Symptomatic treatment includes taking a non-prescription analgesic, such as acetaminophen (e.g. Tylenol) or ibuprofen (e.g. Advil), use of heat or ice on the breast, and wearing a well-fitting bra. In some women, particularly those with irregular periods, taking low-dose birth control pills may be of benefit. In post-menopausal women on hormone replacement therapy, taking a periodic "vacation" from estrogen each month is sometimes beneficial. Can fibrocystic breast changes develop into cancer? Fibrocystic changes pose no increased risk of developing cancer. However, fibrocystic breast changes can make it more difficult to distinguish developing breast cancer from fibrocystic lumps. Additionally, mammograms to screen for breast cancer can be more difficult to interpret when fibrocystic changes are present. This can lead to the increased need for additional testing such as ultrasound or biopsies. Caffeine avoidance, including chocolate, sodas, coffee, and tea. Eating a low-fat diet, with fat constituting less than 15% of the day's total calories. Using evening primrose oil, an oil that is high in gamma-linolenic acid. Before taking any medication or supplement, particularly if you are on other medications or could be pregnant, it is best to talk with your doctor first. If you have any questions about breast changes, please log into your account and send us your question. We are here to help.